As a Troll SK I needed the giant snake rattle for my newbie armor helm quest. Giant moccasin in Innothule are a pain to hunt (as a poorly geared bad swimmer). I got my rattle off the Darkweed snake in South Ro. Got one off a giant rattlesnake in Commonlands. Makes sense, right? Giant Rattlesnakes should drop giant snake rattles. Picked up one of these from An Emerald Adder in Stonebrunt, near Mt. Klaw tonight. The chasm crawlers in East Karana drop the giant snake rattle. the hill just north of the High Hold Pass entrance (523, -2061 area)had lots of snakes to kill and drop rate seemed decent. Yeah, there's large rattlesnakes there but they drop large snake rattles, not giant snake rattles which is what's needed for practice runes. Though listed in another post here, it's not listed on the page that these drop off "a giant moccasin" in Innothule Swamp, which they do. Found one on the first I killed, but none on the next couple, so I can't say for certain whether other posters' claims of it being a rare drop are accurate, only that it wasn't so for me. In the Warrior Other Task of the Northern Wolf two giant snake rattles are needed. I made a mistake and gave the taskmaster two snake rattles in addition to the two perfect knoll skins. I got a reply, "Your Bravery has lowered" or something like that. 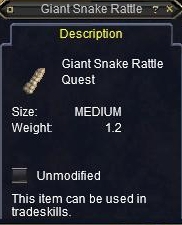 I guess there is a difference between Giant Snake Rattle and just Snake Rattle. So it's back to Black Burrow. Plus the usual Quill and Parchament. Also drops from snakes in West Commons and East Karana. It also drops in East Commons off of giant rattle snakes. Just don't confuse them with the large rattle snakes. They also drop very rarly off Giant Water Moccasins in Innothule Swamp. They are used for Froglok Paladin Arms and Helm quest. Its uber rare drop from Giant Water Moccasins. I traveled to South Desert of Ro to hunt the Giant Rattlesnake but I didnt find em. Anyone knows where this Giant Rattlesnakes are in South Desert of Ro? Can anyone tell me what the quest is for the rattle? Had several of them and just sold them to a merchant. What good are they to a 11 season Ranger? Any response would be great.